If you suffer from chronic back pain, you might be asking yourself "What can I do to get out of this pain?". We've compiled a list of five handy tips to help reduce your pain. You've probably heard that smoking can cause long lasting damage to your lungs and can be detrimental to your overall health, but did you know that smoking can actually contribute to the back pain that you experience? Nicotine can cause restriction of blood-flow to the discs in your spine which can increase the likelihood of your discs experiencing issues such as cracks, ruptures, or drying out. Additionally, smoking reduces the overall oxygen level of your blood which can cause the tendons and muscles that run through your back to be starved of the oxygen that they require to function optimally. Ensuring that your diet contains the necessary antioxidants, as well as vitamin D and calcium can help keep your spine and other bones health and strong. Deficiencies in these key nutrients can also lead to other problems down the line including osteoporosis which is a common cause for back pain in older women. Your core muscles are critical components of your body and maintaining them can greatly improve your physical fitness, lower your current chronic pain levels, and help reduce the risk of further back injuries. Exercising at least twice a week with an emphasis on exercises that are specifically designed to help strengthen your abdominal and back muscles. If you have a job that requires you to sit for extended periods of time, try to get up, stretch, and walk around throughout the day to keep your muscles healthy. Standing and sitting with the correct posture can have an immense effect on the level and type of chronic pain you feel. Avoid hunching your shoulders, slouching, or bending sideways while standing whenever possible to help keep your spine protected and healthy. Of course, if your pain fails to improve or is severe and impacts your daily life, there is no substitute for proper medical care. 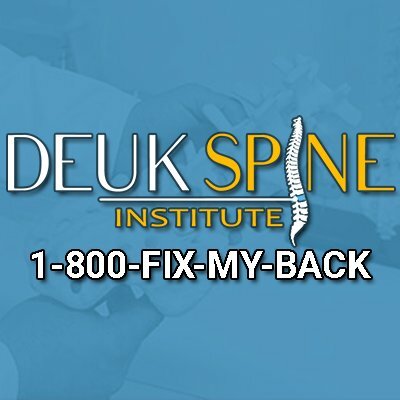 At Deuk Spine Institute, we offer a variety of minimally invasive and cutting-edge treatments to help relieve all kinds of neck and back pain. Many of our patients do not require surgery and have their neck or back pain eliminated through injections, physical therapy, and other non-invasive treatment options. For more information or to schedule an appointment, please call (321) 751-3389 and speak with a member of our patient services team.